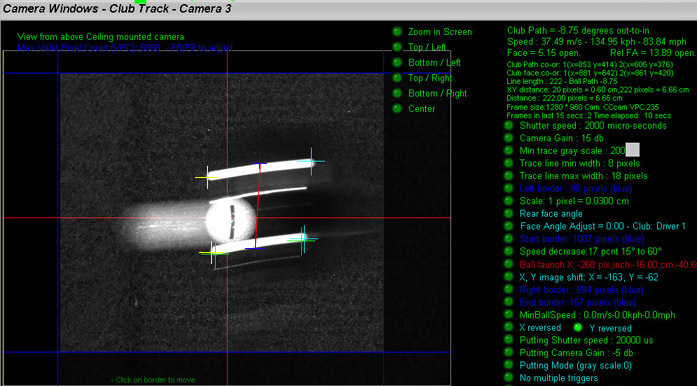 triggers the camera just before the club makes contact with the ball. that result in and produce club dot traces in contrast to freeze frame images of the club. 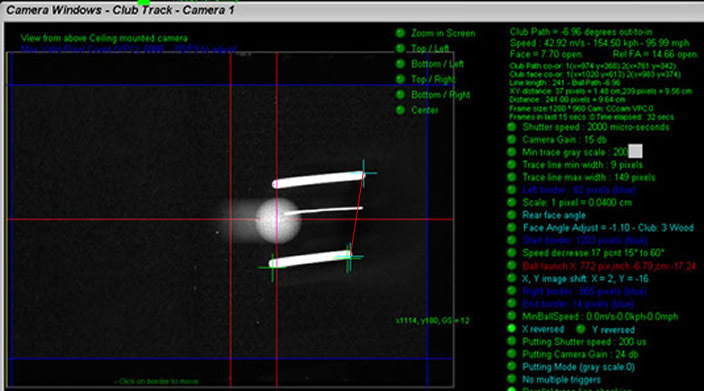 These traces are used to detect the club face angle at impact to the ball, the club path and speed. In contrast to the CTS - that uses color cameras that require a visible flash - the Ccam uses invisible to the eye IR light and there is no flash. 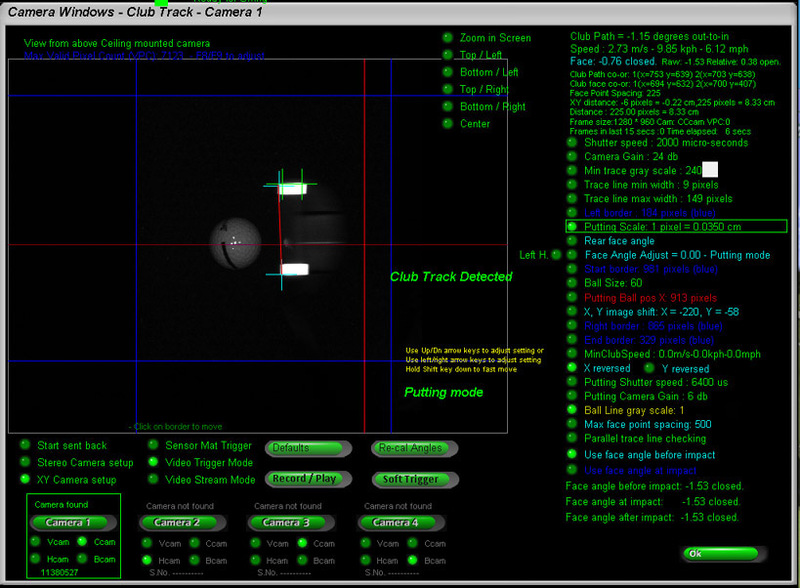 This video shows the setup parameters for the club tracking camera with examples of various club shots. If using the Ccam CTS as stand-alone system - i.e. 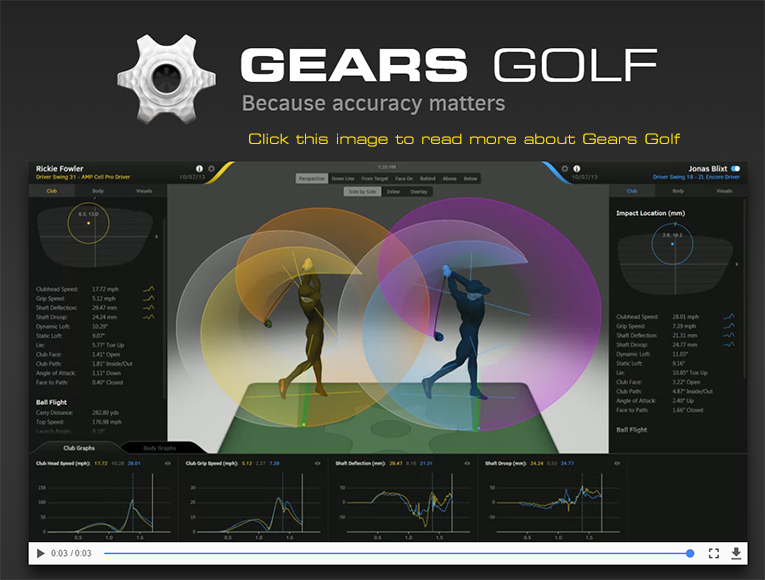 without ball tracking cameras - the section showing how to adjust the club/ball smash factor will be of interest. The system requires one or two reflective tracking dots be adhered to the top of each club. 40 club tracking dots and 18 squares are supplied with the system. For irons you can use the square ones so that they fold over the club edge easier. Cut the squares ones in half to get two long sided track reflectors. The above image is an actual camera shot using a HD lens of a 3 wood just before and after striking the ball at nearly 100 mph. 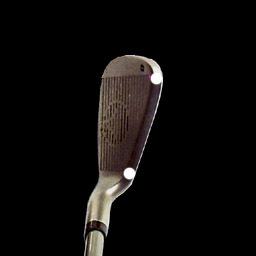 You'll notice that the club itself is barely visible but the trace of the reflective tracking dots is very visible. SD lens cameras capture a smaller image but still functions well. An advanatge with SD lens systems is that they are easier to aim and focus. 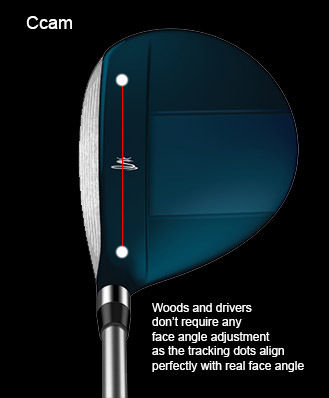 Applying the 2 tracking dots is quite simple on woods, drivers and putters. Just ensure that the 2 dots are in line as accurately as possible and are set reasonably far apart. Also ensure that the surface of the club is clean and grease free before hand. The top edge of irons and wedges may be slimmer than the diameter of the reflective dots in some cases but this is not a problem. 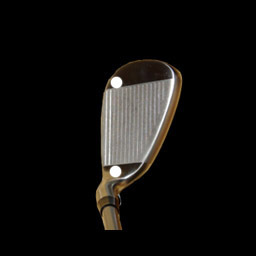 Just wrap around any overhanging edges to the back or face of the club. For high lofted wedges we recommend that the dots be adhered to the lower side of the actual face of the club. This ensures that they are more visible to the camera. 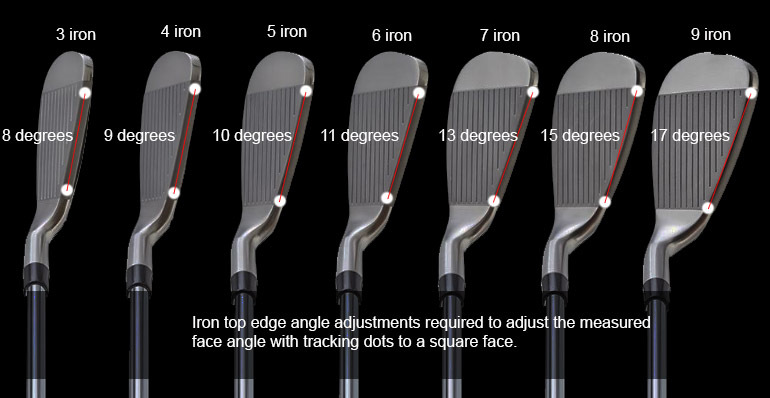 You'll notice that is is not possible to get the dots in line with most irons. In this case the Face Angle Adjust setting in the camera software window (see below) is used to compensate so that the correct face angle is measured. 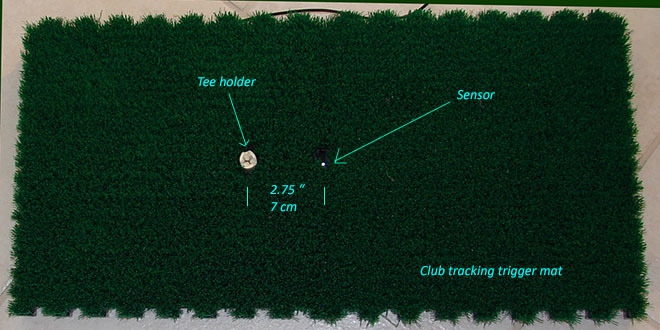 place the club as square as possible on the mat and move the club over the trigger sensor to capture a camera shot. 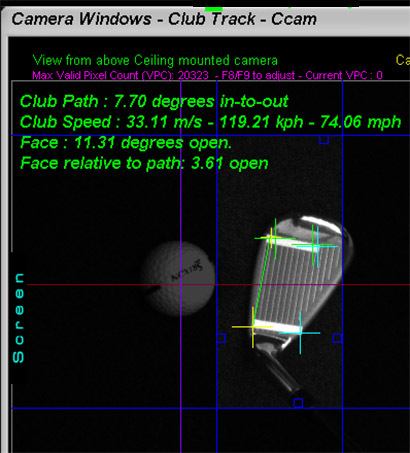 The software will then measure the club face angle. This angle will be some degrees open. 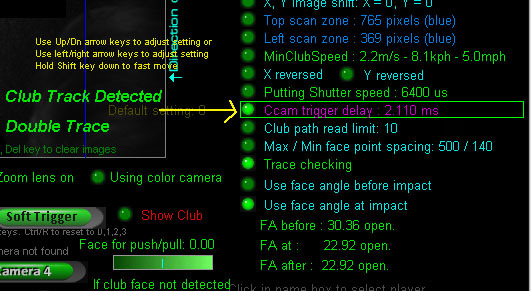 Note: Switch off the Parallel trace line checking when setting club angles otherwise camera processing won't function correctly at these very low club speeds. as shown on the right-hand side of the Face Angle Adjust parameter setting in the camera window. Now press the F5 key to set the adjustment so that the measured face angle is zero. You can also increase or decrease this setting manually with the up down arrow keys on your keyboard. The measured Face angle is shown on the 3rd line down on the right hand side of the screen. The setting is automatically saved so no need to click a special save button. Repeat this procedure for all the irons that you are using. The setting can also be used for any other clubs in use if required. 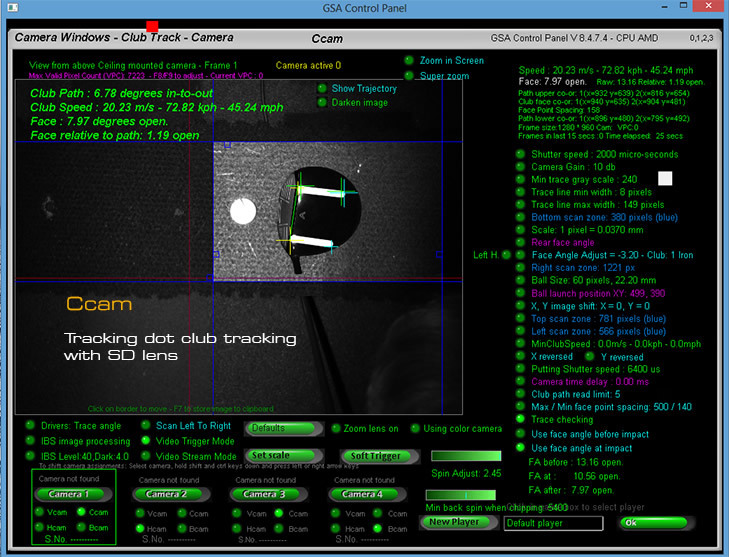 A major critique we hear from many potential Ccam and CTS customers is " I don't want to have to stick any kind of tracking dots or strips to my clubs"
Well - unfortunately - there's no way to avoid this - as all other camera based golf simulator manufacturers have discovered. Even the most expensive camera based club tracking systems in the world - costing upwards of $18,000 - haven't figured this one out yet. using either tracking dots or our supplied white plastic strips to be adhered to all clubs. Note that the tracking dots or strips we supply are easy to apply and remove and won't in anyway harm or damage the clubs. then don't fall for this marketing hype unless you see absolute concrete evidence to the contrary. Because otherwise it simply doesn't exist! 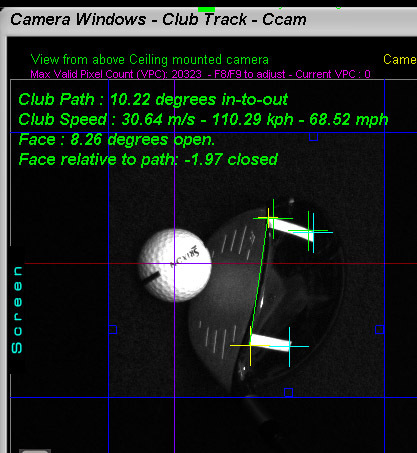 The club tracking software shows 3 stages of the club path and club face angle. The light blue cross hairs at the start of the trace (right hand side of the image) show the club face angle just before impact. The blue cross hairs club face angle at impact and the yellow cross hairs just after impact to the ball. but using the face angle after impact is not recommended as the face angle will change due to the impact force. 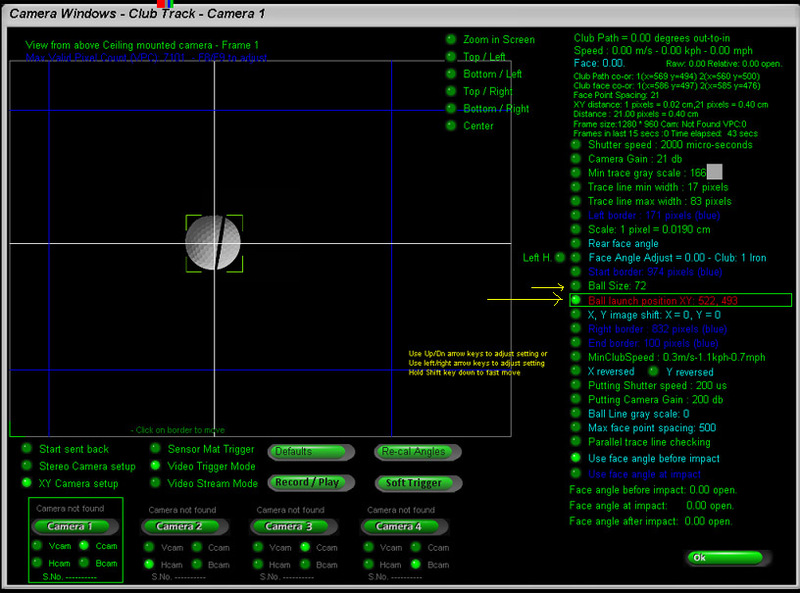 The above image shows the standard camera settings for the Ccam for normal shots. 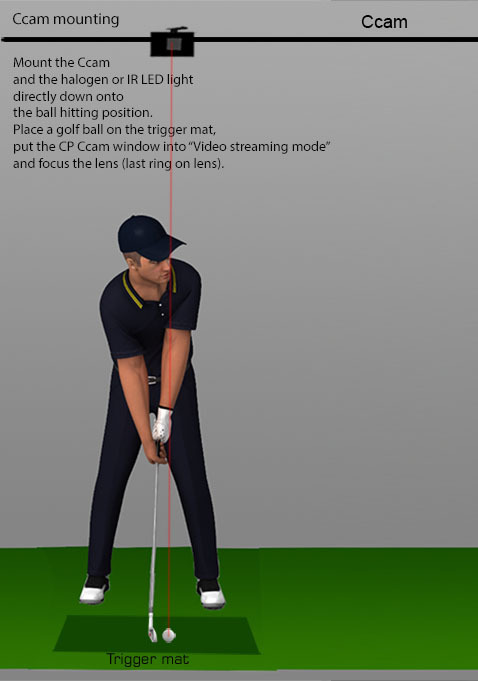 The above image shows the standard settings for the Ccam when putting. The camera should be overhead mounted either directly over the ball/tee position on the supplied trigger mat or somewhat forward. 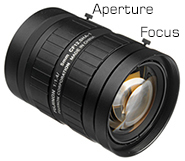 The camera is pre-focused but may require slight adjustment if not mounted at the standard height of 9 to 10 ft. If the Ccam is forward mounted then there should be no need for face angle adjustments with irons. Single tracking dot camera club tracking is now available with the new CP. Using two tracking dots - especially on irons - required a rather lengthly setup so we are simplifying this with an optional single tracking dot method. This option will allow users to place just one tracking dot on the clubs instead of two and thus the requirement to setup iron face angle adjustments will no longer be necessary. 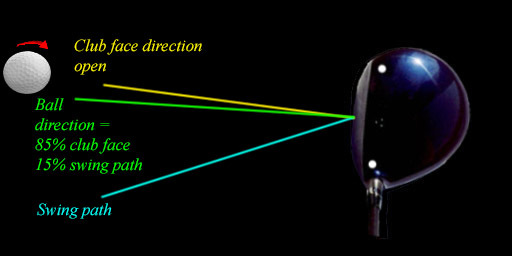 In this case, club face angle is calculated from the ball path relative to club path. 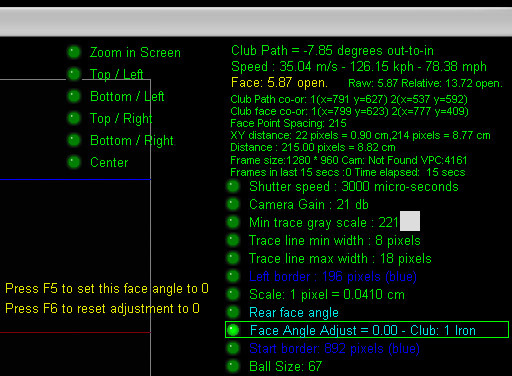 Face angle is almost always 85 percent of ball path so we can use this ratio to show club face angle. Woods and drivers don't normally require face angle adjustment though so the user can opt to use double tracking dots for just these clubs and leave the irons on single dot tracking. 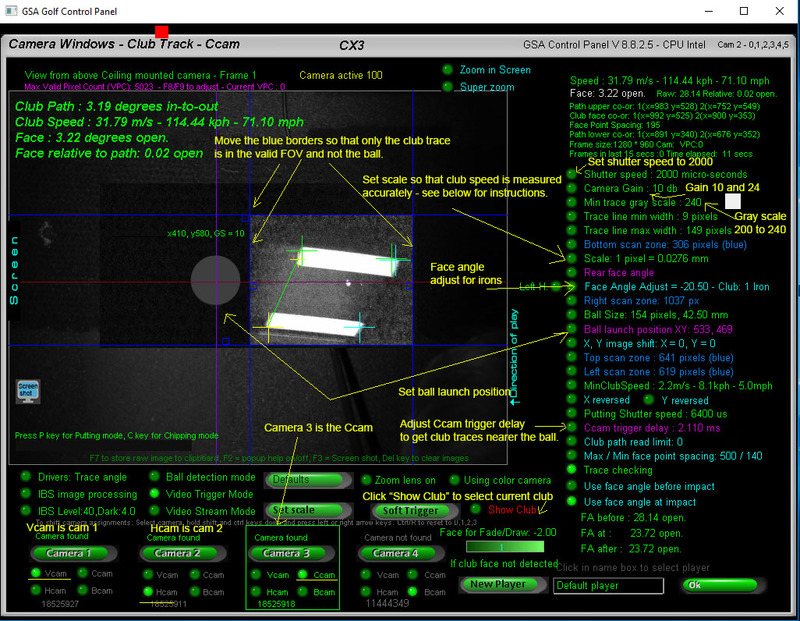 The system will automatically detect if a one or two tracking dots are on the club and - if two - whether or not a specific club setup has been made for the player. If no player club set adjustment profile exists, then a default adjustment profile will be used. 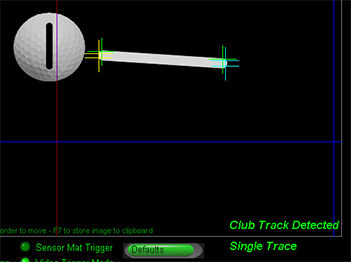 For single trace club tracking, place the single tracking dot over the sweet spot of the club. i.e. usually in the center. The ball will always be played from the exact same spot on the hitting mat when using the club tracking camera. 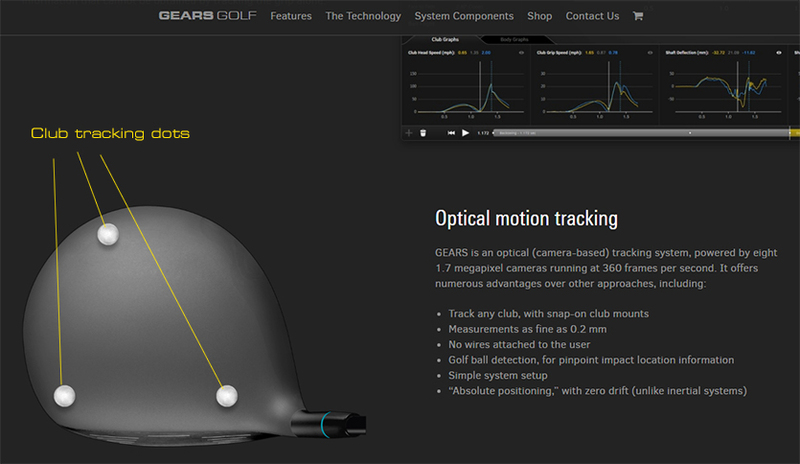 Note: If you have ball tracking cameras then the ball can be played from other surfaces. Club tracking won't be available in this case. 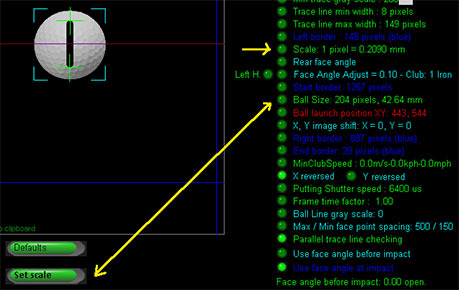 In order to calculate the face angle at impact, the ball launch position should be setup in the system. To do this, place a ball on the tee holder on the hitting mat and click the Soft Trigger button in the Club Tracking window to grab an image. Select the Ball Launch Position button and use the keyboard's arrow keys to move the hair-line cross to the center of the ball. Select the Ball Size button to adjust the green borders to the ball size. 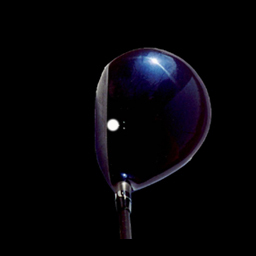 Ball on club face position scaling factor. 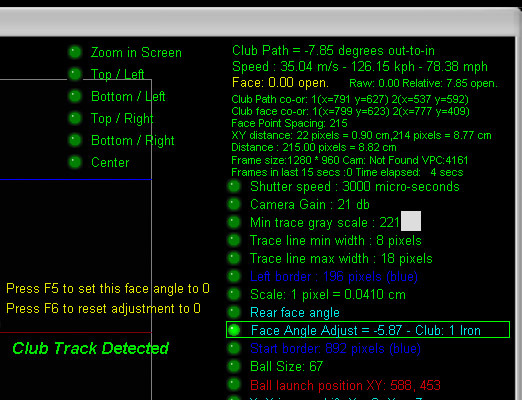 The After Shot swing analysis window now features a "Ball on club face" position scaling factor. To adjust, hold the shift key down (a factor is then displayed) and use the arrow keys on your PC's keyboard to move the ball. Use the up/down arrow keys for the top view club/ball image, left/right arrow keys for the club/ball image front view. Test by playing shots striking the ball on the heel or toe of the club and comparing to the ball position images in the swing analysis window. Adjust accordingly if required. Club lofts can be changed with the CP. If you are using a GSA Golf system that doesn't measure ball launch angle (like the Ccam or PX2 stand alone systems) then the loft of the club will be used for the launch angle.
. i.e. if hitting on the down swing then decrease the the loft angle, if hitting on the upswing then increase the launch angle. If using a system that does measure launch angle then this feature will allow you to fine tune the club attack angle calculations. The standard loft for each club is displayed next to the current loft angle. Club speed is dependent on the scaling factor, average length of the two trace lines, lens zoom and camera shutter speed. 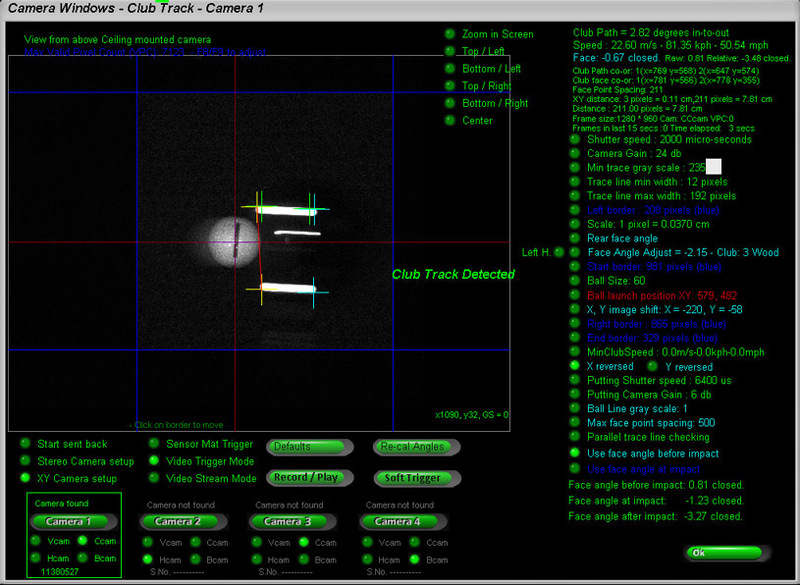 To setup the club track camera so that the correct club speed is measured, the pixel-to-distance scale must be set correctly. This scale is used to calculate the distance (the length of the trace in pixels) the club traveled during the camera's exposure time. 1. Place a golf ball on the hitting mat and click the the Soft Trigger to grab a frame. The image processing software should find the ball and it's size and automatically set the scale for you. or its size is not correct then go to the setup window and switch to LX Lite. ( min ball gray scale and or / ball max or min size) until the ball has been detected correctly. Then switch back to Ccam mode and repeat the Set Scale procedure. diameter to calculate the scale. Alternatively, you can measure the size of the ball in the image by right clicking on the left side of the ball and moving the mouse cursor to the right side. The distance will be shown in pixels. In the above image, the distance was 208 pixels. Scaling factor was set o 0.2050 which resulted in a ball size of 42.64 mm. In order to get the club trace nearer to the ball, you can set a trigger delay time. Using CP version 8.8.4.2 or above, try adding a trigger delay and taking a full swing to test the delay. The higher the delay time is, the nearer the ball trace will get to the ball. If the delay is too great then the club trace will exceed the ball position. As long as the ball doesn't interfere with the trace detection then this is okay. You can then choose to use either the club face angle before or after contact with the ball. You can also re-mount the trigger sensor in the trigger mat closer to the ball if you like. This will require drilling a new hole in the mat though. 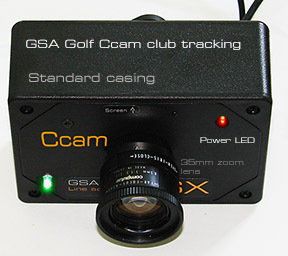 The Ccam camera is triggered by a sensor in the supplied trigger mat. The mat should be placed so that the overhead halogen lamp is directly over the sensor. Connect the cable from the trigger mat to the Ccam. 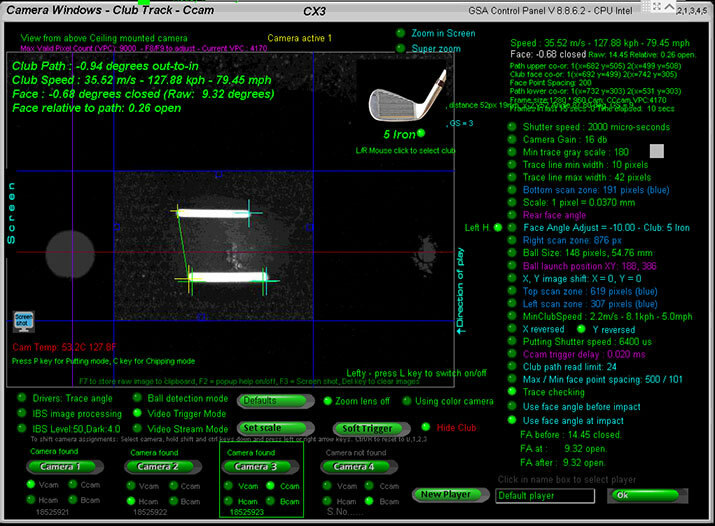 The green light in the Ccam should flash evertime you swing your club over the mat and sensor. Connect the supplied USB power connector's USB cable to the Ccam. Plug the USB power adapter to a 110/120v outlet. 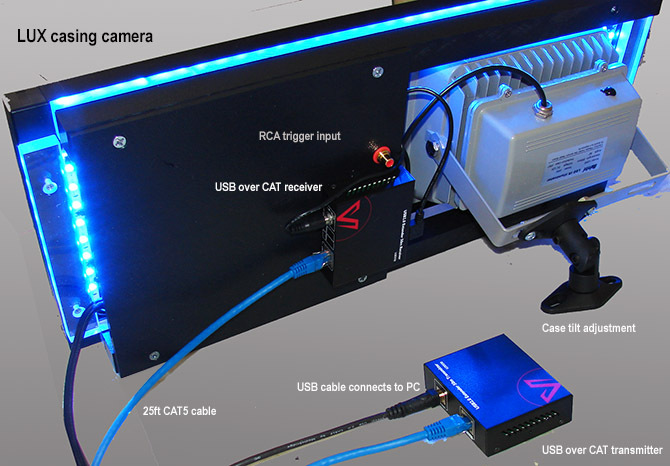 The camera is connected to the receiver with the power adapter via a short 6ft USB, then the long (25ft or so) cat cable from the receiver to the transmitter, and then the PC to the to transmitter via a short USB type B cable. 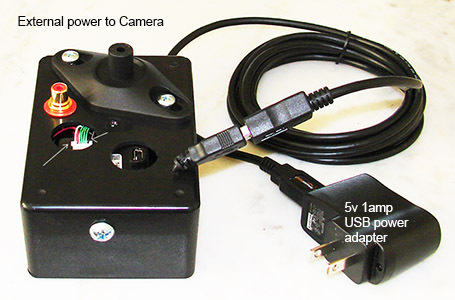 Note that the camera itself has to be supplied with external 5v power when using USB over CAT ! 1. Connect the miniB Usb cable to the camera and the type A connector to the USB over Cat adapter receiver. To identify which camera is which you can click the "Soft Trigger" button to grab a new image or set the camera to "Video Stream Mode". From the images you should be able to see what camera was being triggered. If you find that cameras are not being assigned in the correct order then you can manually re-assign the cameras. To do this, select the camera in the CP cameras window, hold both the shift and ctrl keys down, and press the left or right arrow keys to move the camera up or down the sequence. Note that color cameras - as used in the CTS club tracking systems - will appear in monochrome if not correctly assigned. i.e. 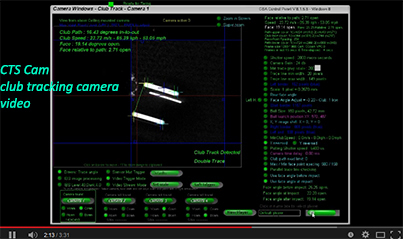 if a color CTS camera appears as camera 1 in the control panel then the images will show in monochrome instead of color. CTS color cameras must always be assigned to camera positions 3 or 4. If you're using the latest CP version V 8.6.4.9 or greater, switch the camera fixed "Assignments" OFF to start with and restart the CP. Once the correct camera assignments are made you can save them by clicking on the "Save Assigns" button in the Vcam window. A major critique we hear from many potential CTS / Ccam customers is " I don't want to have to stick any kind of tracking dots or strips to my clubs"
The Foresight Sports' GCquad and GC2 HMT - priced in the $15,000 to $18,000 range - require up to 4 dots to be applied to the face of the club. 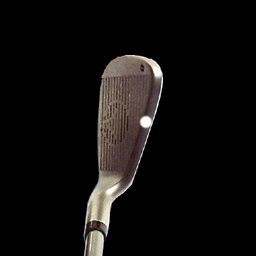 In contrast, our 2 dots are placed on the top of the club so won't get hit by the ball and will stay on there. BTW Note that for the price of a single GCquad without enclosure, you can get 2 of our F3 simulators complete with enclosures and beamers! 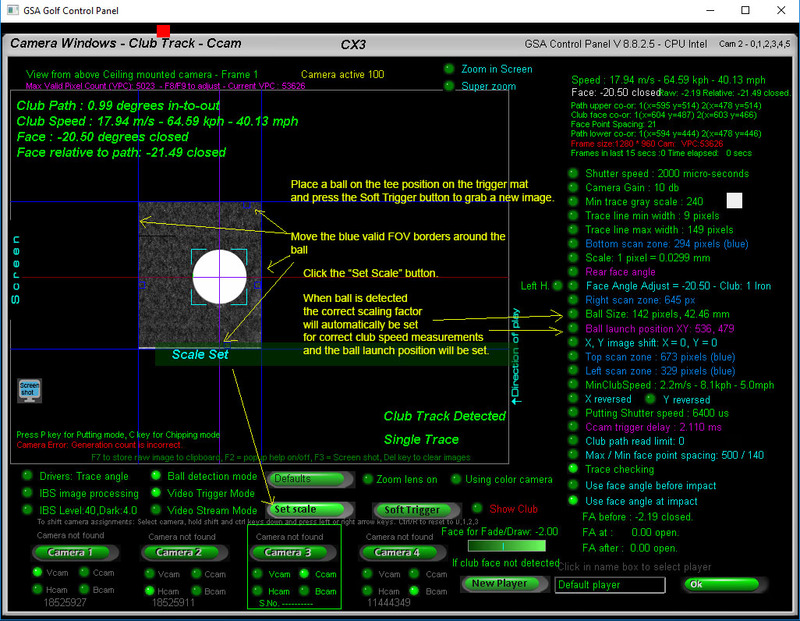 Are you looking for perfect accuracy to work on - and improve your game ? Or do you just want to play a few rounds with your buddies for entertainment ?